Nursing vacancies in England have risen by 17% to nearly 42,000 in three months, latest NHS workforce data reveal. Following publication of the figures by NHS Improvement today, health think tank The King’s Fund said the increase in staff vacancies could turn into ‘a national emergency’. The data, covering April to June this year, revealed there were 41,722 nursing vacancies by the end of June, a 5,928 increase on the previous quarter. This equates to around one in nine posts (11.8%) being unfilled. King’s Fund chief analyst Siva Anandaciva said NHS Improvement’s findings heralded a tough winter ahead for the NHS. ‘Widespread and growing nursing shortages are symptomatic of a long-term failure in workforce planning, which has been exacerbated by the impact of Brexit and short-sighted immigration policies,’ he added. RCN England director Tom Sandford called on the government to investigate the ‘sudden spike’ in vacancies. ‘This report paints a bleak picture of rising demand and unsustainable workforce shortages, and betrays a huge over-reliance on bank and agency staff in England,’ he said. 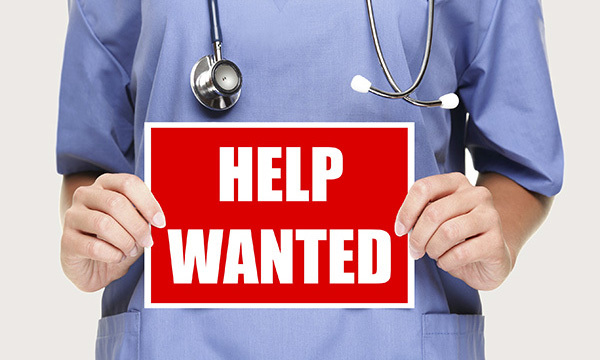 Of the nursing vacancies, 80% were filled by bank or agency staff, according to the report. NHS trusts spent £805 million on bank staff and £599 million on agency staff in the quarter, which equates to £102 million and £32 million over their respective allocated budgets. NHS Improvement chief executive Ian Dalton said staff were doing their utmost to meet demands on the service, which include a rise in emergency department attendance and high bed occupancy rates. The report also reveals 107,743 overall NHS staff vacancies in England at the end of June, a rise of 9,268 on the previous quarter. NHS Improvement said the increase – the result of rising demand for services and high leaving rates among staff – is forecast to continue throughout the financial year.